Energy, action, excitement and entertainment-that's what it's all about! 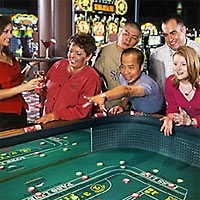 Seneca Allegany Casino & Hotel, Salamanca, offers world-class gaming, state-of-the-art slot machines and your favorite table games, as well as great dining and entertainment. Seneca Gaming and Entertainment, Salamanca, features some of the biggest daily Bingo payouts in Western New York, tons of specials and promotions for those 18 and over.